Thomas B. Read, ed. 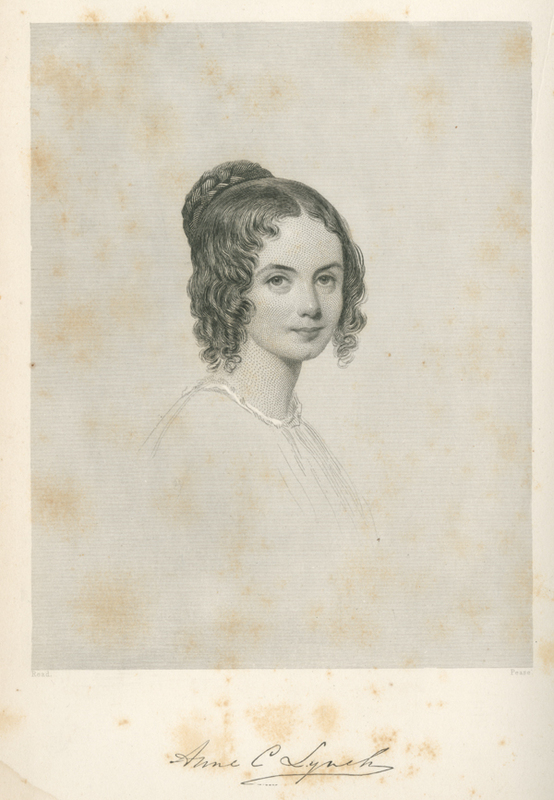 Female Poets of America (1849), plate opposite p. 265. After the death of her father, an exiled Irish patriot seeking land in Cuba, Anne Lynch Botta lived with her mother in Hartford, Connecticut. 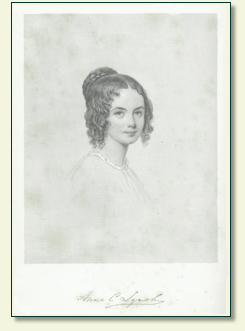 At sixteen she enrolled in the Albany Female Academy, and, after graduating in 1834, she taught school in Albany and Providence while compiling work for her anthology, The Rhode Island Book. Settling in New York City, Anne Lynch Botta submitted work to periodicals, taught at the Brooklyn Girls' Academy, and began to host the receptions for which she would eventually become famous. After a tour of Europe in 1853, she married Vincenzo Botta, an Italian professor of literature, and together they hosted intellectual gatherings at their home on West 37th Street. Unlike other salons, many of which had more to do with seeing and being seen by high society New Yorkers than with providing a creative space in which artists could meet and collaborate, Anne Botta's receptions gained a reputation as a gathering place for great minds, at which Edgar Allan Poe read his early drafts of "The Raven" and Margaret Fuller talked transcendentalism with Ralph Waldo Emerson and Horace Greeley. Though by her own account her greatest skill was as a hostess, she continued to write poetry, newspaper travel letters, and critical articles for several magazines. She published Poems (1849) and A Handbook of Universal Literature (1860), which was widely used as a textbook. She died of pneumonia in New York at the age of seventy-five. In person she is rather above the usual height, somewhat slender, with dark hair and eyes— the whole countenance at times full of intelligent expression. Her demeanor is dignified, graceful, and noticeable for repose. Sarah J. Hale, ed. Woman’s Record (1853), p. 731; also 1855 ed. Evert A. and George L. Duyckinck, eds. Cyclopaedia of American Literature (1855), vol. 2, p. 628.